⚡ Explore ideas based around manipulating dreams and extracting secrets from the sub-conscious mind. Inception is pretty mind-bending… maybe not Waking Life-level mind-bending, but it’s still up there. 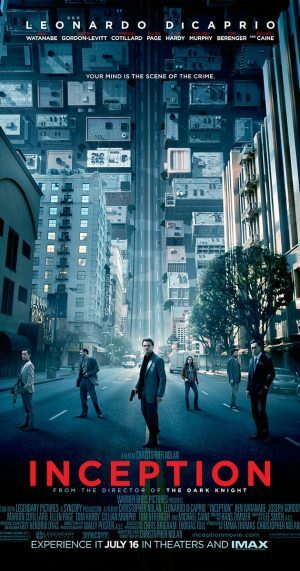 Similar to Waking Life, Inception is about dreaming. A team of thieves, skilled in extracting secrets from the sub-conscious mind, try something tougher — planting an idea in the sub-conscious, hoping that it will reappear in the real world. In order to achieve this, they need to go into a dream within a dream, within a dream — 3 levels of dreams. The amount of thought that has to have gone into coming up with the concept alone is crazily impressive… and then there’s the time spent creating the script and the visuals. The dream worlds that the characters create are beautiful — a mixture of real-world sets and CGI, woven seamlessly together. It’s the kind of thing that is normal to do in video games, but in a film it looks amazing. Definitely a film that you need to watch twice (or more) to really get your head around.